UNDERGROUND COAL GASIFICATION�(rebadged in South Australia as In Situ Gasification) has been experimented with around the world since the early 20th century, but almost all these trials seem to have run into technical problems or created serious pollution, or both, and been abandoned. A power plant using the syngas produced by UCG has been operating in Uzbekistan for more than 50 years, but the environmental impact of this is unknown. Cougar Energy�was the first to collapse, after its Kingaroy operation contaminated groundwater with a small quantity of benzene. It had failed to stick to the environmental guidelines for a production well, and kept the pollution secret for two months. It was shut down by the state government in January 2011. Cougar then attempted to sue the pubic servants responsible, demanding millions in damages, but the case was later dropped. 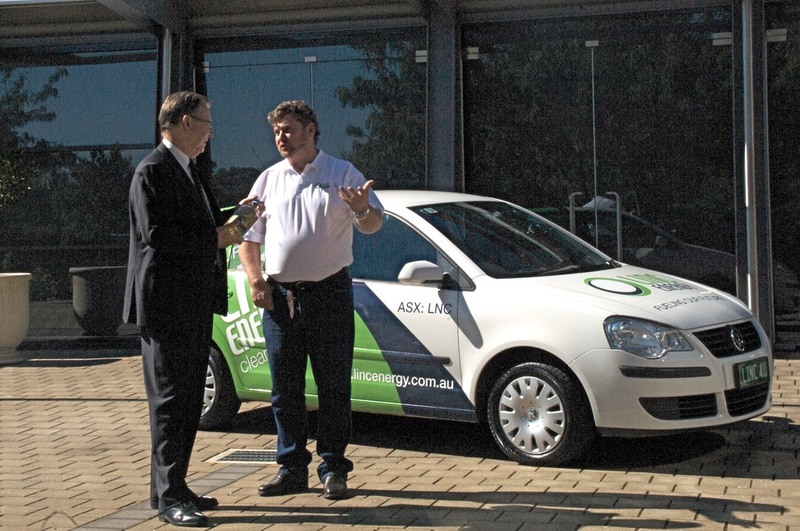 BEFORE THE FALL:��Linc Energy’s Peter Bond in Adelaide in 2011 with then state Finance Minister Michael O’Brien. Bond drove from Brisbane to Perth using Linc’s synthetic diesel. In a dramatic publicity stunt, the company's exhuberant boss Peter Bond drove a car from Brisbane to Perth in 2011 and a year later flew a small plane from Brisbane to Perth, using his synthetic fuel.� In January 2013 the company announced that its fuel production had passed the 6,000 barrels a day mark. Carbon Energy�claims to be the only company to have completed a full-lifecycle, commercially scalable UCG trial, at its Bloodwood site near Dalby in Queensland. It says it has successfully�“successfully accomplished all the recommmendations outlined by the Queensland Government’s Independent Scientific Panel, which included intense, independent environmental scrutiny”. However, an initial leak of contaminated water in 2010 resulted in the company being fined $60,000 plus $40,000 costs. Queensland’s Chief Scientist, Dr Geoff Garrett, reviewed the Scientific Panel’s assessment of Bloodwood, and confirmed Carbon Energy �had�“demonstrated safe and effective decommissioning of the plant”. His review, however was perhaps not entirely independent�— he was chief executive of the CSIRO at the tme Carbon Energy was spun out of the organisation. CE was producing syngas to generate electricity but had to shut down when the Queensland Government’s ban on UCG became law in August last year. The company switched its focus to China, and is now 80 per cent owned by Chinese businessman Huihai Zhuang’s Kam Lung investment group. Carbon Energy is planning to use its keyseam technology to produce hydrogen from deep coal in the Cooper Basin, and is hoping to run a three-month trial there next year.